Me being the OT geek that I am, can't seem to escape OT, even when I'm on my holidays! Whilst away with some friends in Newquay, outside the restaturant/shop part of the complex, I spotted this beach wheelchair. 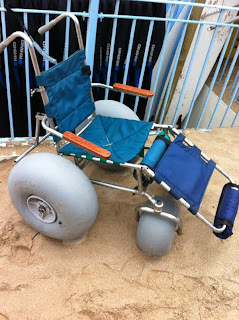 I'd never seen a wheelchair specifically designed for use on a beach before (you might think, being an OT student that I would have figured out such a wheelchair exists, but I'd never thought about it really!). There was a slight gradient to get down on to the beach, and I thought it was awesome that they had left this out so that passers by could see that the beach is fully accessible. When I googled 'beach wheelchairs' lots of different types and models came up, and it's quite interesting to see the range of wheelchairs available. The OT in me was loving seeing this, as not only is it enabling individuals to remain engaging in those activities they enjoy most, but it is also sending out a clear message that disability is not a barrier! Ps Thanks to Will for getting the snap, would have hated to have missed it!